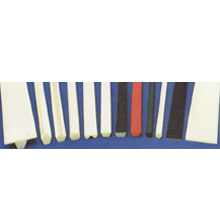 Our Products are made of high grade polyrethane and inserted with steel and higer shear resistance and great strength ensuring optimal performances. High abrasion and wear resistances to oil, grease and many solvents. Screen Printing Belts with Special Profile, to has high abrasion and wear give resistance against high stress that are resistance to oil, grease and often found in applications in the automotive. Link V-Belt comes in Z, A, B, and C sections. © Megadrive. All Rights Reserved. Website by Creative eWorld.